This is an excerpt from an article we wrote for Today's Grocer. It sites excellent consumer demand research related to grass fed beef and a key strategy of using that growing demand to introduce customers to higher margin products. Our studies found that the higher the education level completed (college and above), the greater the preference for grass fed beef. The highly educated account for the majority of revenue generated in quality meats. 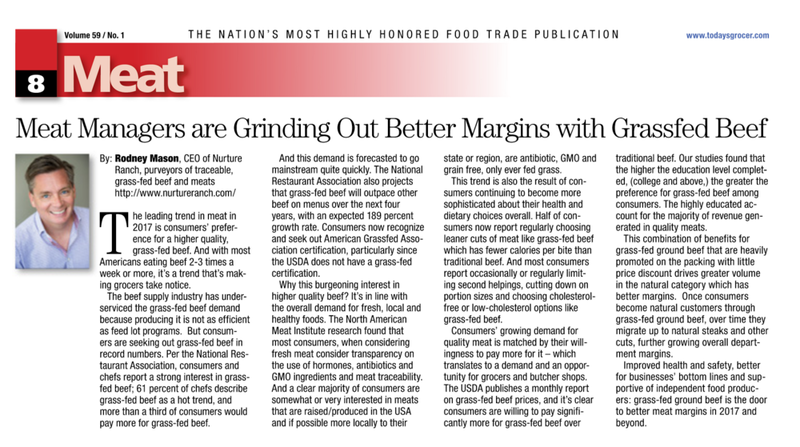 Once consumers become natural customers through grass fed ground beef, over time they migrate up to natural steaks and other cuts, further growing overall department margins. Improved health and safety, better for business' bottom lines and supportive of independent food producers; grass fed ground beef is the door to better meat margins. You can read the article in it's entirety going here and turning to page 8.